November 7, 2017 – As of early November there have already been 19 people killed walking in Nashville in 2017 alone, making this the most deadly year on record for pedestrians. 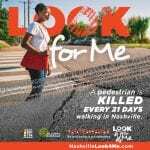 In response to the devastating rise in the number of pedestrians killed while, Walk Bike Nashville is launching the Look for Me campaign. This campaign, which is funded by the TN Highways Safety Office, seeks to raise awareness and keep people walking in our city safe. 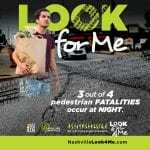 Click here to download a Pedestrian Safety Infographic for more information. As in most years, the majority of the crashes have taken place on major state arterial roads, including Murfreesboro, Gallatin, Nolensville and Bell Road. Walk Bike Nashville recently conducted a study of pedestrian fatalities from 2012-2016 and discovered that fully 83% of all pedestrian fatalities occurred on state roads, which have higher speeds, multiple lanes, few safe crosswalks and high numbers of transit riders. 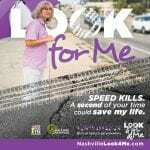 The Look for Me Campaign will be piloting along Gallatin Road, which saw 10 pedestrian fatalities from 2012-2016, making it the most dangerous road for pedestrians in Nashville.